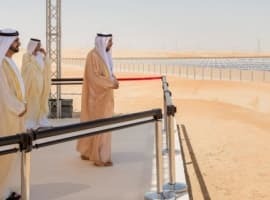 Solar and wind farms, stretched across North Africa's Saharan desert and relying solely on existing technologies, could produce enough electricity to power the entire world. (That amount of electricity approximates over 21 terawatt hours.) As an added benefit these combined wind and solar arrays would also increase rain fail in the arid Sahel region thereby slowing the steady southern encroachment of the desert. This was the conclusion arrived at by academic researchers using supercomputers. Teams at the University of Maryland and University of Illinois modeled their results in a study financed in part by a Chinese government agency. Their results were published in the prestigious journal Science (September 7). Yes, we know it sounds farfetched. And even perhaps too ridiculous consider. But is it any crazier or more uneconomic than the two biggest nuclear construction projects currently underway in the U.S. and Europe? Spending $25 billion or more to erect bespoke nuclear power generating stations (when a comparable gas fired facility could be built at a relatively small fraction of the cost) shows that regardless of economics, for those that the politicians favor, funds can often be found. And it is not just new nuclear technologies that should be singled out for economic excesses. Southern Company's recent attempt at building a truly clean coal electric power generating station resulted in the $4 billion Kemper County project in Mississippi. That facility now only burns natural gas rendering large parts of the investment economically irrelevant. But for sheer scale it is typically nuclear construction that provides the biggest numbers. In this regard consider the proposed $20-$30 billion ITER nuclear fusion project. The point? We already spend huge sums to experiment with and develop increasingly carbon free power sources. From a technological perspective the Sahara wind/solar project is practically "old school". It relies exclusively on so called off the shelf, existing technologies. A German consortium, DESERTEC, proposed a Saharan solar project in 2009 based on work that goes back to the 1980s. The organization made promising financial projections based on its research. Its shareholders included major Mediterranean infrastructure and electricity firms and State Grid of China. 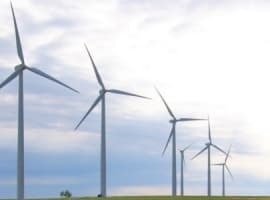 Wind and solar projects can also produce “unintended consequences” for the environment as the Illinois and Maryland researchers gently put it. In the Saharan case though, the consequences, more precipitation, might actually be beneficial. From the perspective of the earth's surface, wind and solar farms change surface roughness and reflectance. This raises local temperatures--the last thing the Sahara needs. However, the temperature boost also increases the likelihood of precipitation, in fact doubling it in this particularly arid region. That would in turn lead to increases in vegetation growth. More vegetative ground cover increases evaporation which, in turn, increases precipitation. Solar farms by themselves could have a similar environmental impact. Admittedly, the university researchers did not address a whole host of concerns: social, political, business and technological. The challenge of constructing solar and wind farms across the Sahara Desert and then delivering the power to those who need it is a daunting task. But the researchers did interestingly address the impact of the project on climate and concluded it would be beneficial. That’s at least a start. Would relatively small European and American energy companies rise to a challenge of this magnitude? Or would the Sahara project developers, if there is one, propose this ambitious project to the Chinese as part of their One Belt, One Road Initiative? From a policy perspective China has made no secret of its interest in Africa. It would be ironic if they embarked on an ambitious undertaking like this while domestically the US plays "small ball" and focuses on subsidies for relatively uneconomic coal and nuclear power generating stations to extend their economic lives. The study financed by the Chinese. Hmmm. Apart from their exploitation of the rest of Africa it's doubtful they'll involve themselves in such a boondoggle. The Sarah is the hottest desert, the sand nearly two football fields deep, never mind it shifting. Foolish nonsense. Everybody knows that plants nd CO2 and that if CO2 drops below 150 ppm, the plants die. Greenhouses pump CO2 IN to make their plants grow faster. If you want to gren the Sahara you have to ADD CO2, not reduce the trace gas. Plants can thrive at 2800 ppm. Do the experiments and stop the foolish nonsense! This feedback comment doesn't need to be publicly visible. 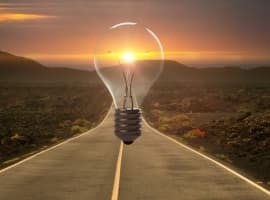 The sooner the fossil industry gets out of energy, the sooner renewables will deliver on the promise of economies of scale that fossil has long lost, the sooner fossil companies can start taking advantage of renewable power to produce durable goods for far more profit. Plastics, paints, building materials, industrial chemicals, fertilizers that accelerate plant growth to actually serve bio-capture of carbon from the air, pharmaceuticals that heal instead of particulates that harm.. all of these come from fossil and at higher profit margins, so long as you don't burn what you take from the lithosphere. Old news... other than the climate models. There was a plan to place heat engines in the Sahara to generate electricity for Europe... but then coal won out. Those heat engines were not nearly as efficient as today's solar, but then our electricity consumption is a tad larger than it was projected to be back then. The objections then were probably the same as today... something about political instability. But, on this go-round, having some job-creating megaproject in Libya might do Europe some good. Making it a government-sponsored megaproject and framing it as an illegal immigrant solution might actually get European citizens willing to pay for it. Since the hard science proves that there are no such thing as GHGs, which means AGW is a fraud and nothing more than a swindle perpetrated by con artists, why on Earth is this website publishing this kind of disinformation? This whole concept is nothing more than a giant swindle perpetrated by vested interests. These crooks are scamming those who can least afford it, the third world. CO2 is a blessing and a gift and the more the better, so there is no reason to restrict any fossil fuel consumption, most especially natural gas, the cheapest, cleanest and most affordable source of the energy, the third worlds so desperately needs. The AGW fake science, is a criminal act of Genocide, against the poorest and most defenseless. Why is this website NOT championing the cause of science and the petroleum industry, instead of these shameless, greedy opportunists? In theory yes. However anyone who has worked in Saudi can testify sand and heat do not translate into ideal solar power zones. Like other dessert areas the big problem is dust. Put a panel up one day and the next it's covered in a layer of fine sand. Within two days it's got a thick layer on it, rendering it useless. Even if you could keep the dust off, sand scours everything. Within a few weeks in Saudi a panel looks like a dull beige wall. The efficiency drops like a stone off a cliff. So it sound like a good idea but in practice any solar farm will quickly become useless. Our comment on the comments. The project may not be a new idea, but we are sure it is to many readers. However, our purpose was to report the research on the environmental benefits of such a project, assuming that it gets built. That research is new information that indicates environmental benefits that could offset project costs. Building it will prove difficult and there may be more economical ways to achieve the same goals. However, with such a big payoff possible, wouldn't it more productive to seek solutions rather than cite difficulties? On the question of electricity usage worldwide, it appears to be about 21,000 TWH per year. We apologize for the misstatement of quantity.